This place has been given a nice lick of paint and a general, all-over spruce up, and is now looking very spick n'span. Popped in last Friday and the place was quite buzzy and the beer was excellent - Jennings Bitter and a pint of Pedigree both tip-top. A few weeks ago we went on a sunny Saturday afternoon and the beer garden in front was full with happy punters and once again the beer was excellent. I think prices may have dropped too as my Jennings the other night was �2.65 - as good a price these days as any round these parts. I think it worth revising my comment below and note that this is a place I may very well like as my local. We shall no doubt be popping in more often. Enjoyed this place, though in fairness my visit coincided with it being empty and quiet, so cant comment on what it's like when packed. 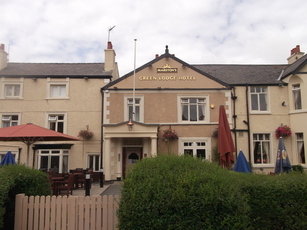 Really good ale and staff were excellent - well trained and prompt. Ordered food and despite it being quiet, it took a while, however by far the best pub grub I have had on the Wirral in years. Only complaint I have is the price - �3.00 for a pint is steep, its not London you know! A Marston's 'Two for One' pub. So it goes big on the food. Not the reason I visit pubs, so I can't comment on it. Still you can get the Marston's range of ales, and they aren't bad here. The staff are pretty good too, seem well-trained and work as a team. Rambling place inside with the feel of a hotel reception. Lots of golfing memorabilia (it's very near the Royal Liverpool Course). Nice garden out the front. Can get very busy. Hence my comment on the good staff. Not the place I'd like as a local but for a quite drink early doors in the garden or inside it'll do.